I have just returned from delivering my son at school. It's only a 1 mile trip and takes in a rural stretch of the A340. Son was dropped at school and I set off home. I was in my 1986 Porsche 924S and approaching the corner in the screenshot at about 55mph - the limit is 60mph. At about 100 yards before the corner - a lovely constant radius right hander that is completely blind due to the high hedgerow - I saw an articulated HGV on my side of the road. The HGV was attempting to overtake a cyclist - clad head to toe in banana-yellow lycra with a little hat perched atop his head. The HGV had obviously started the move whilst rounding the corner and at the time I saw it the rear wheels of his trailer were almost touching the kerb on my side of the road and the front of the cab was straddling the central white line. At that very point, for a millisecond, I thought I was going to die - crushed under the rear wheels of the enormous HGV. That was at about 8.50am this morning. Two things saved me. My reaction time and my car. I instantly slammed on the brakes. The Porsche doesn't have ABS but as soon as the wheels locked I unconsciously released pressure on the brake very slightly to regain grip. The Porsche may not be high tech but it is both very light and has great brakes. 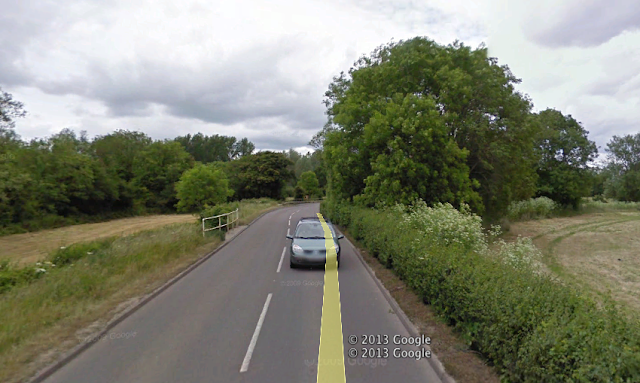 I could not have steered off the road due to the kerb and metal railing to the left of me. The HGV driver saw me but had the cyclist to his left. By the time we met he had just completed his move and I had braked enough that I missed his trailer by an inch. Had I not slowed I may be dead. Had I set off from school 5 seconds earlier I would surely be dead in a head on (and under) impact. Had my Porsche's brakes not been so good I might be dead. Had I not reacted so quickly I would be dead. Had I been in a bigger, heavier car with poorer brakes I might be dead. The lessons to be learned are to make sure your car is well maintained, to concentrate at all times behind the wheel and to practice emergency braking. The lorry had yellow on its cab with blue on the trailer and had foreign plates. I remember nothing else of it. After the incident he (or she) carried on regardless, no doubt needing to get somewhere and damn whoever gets in his way. I looked in my rear view mirror. I could see smoke from my own tyres and the disappearing HGV. I then rounded the corner and drove home, slightly shaken. Incidentally the photo below is of a Slovakian car transporter. I took the photo on the way to school whilst sitting behind it. The transporter had been driving erratically. It is inappropriate to attempt to drive a vehicle of that size down the lane we were on, and certainly inappropriate to drive it in the manner it was being driven. Maybe non-UK truck drivers need a lesson in manners when they enter the UK.